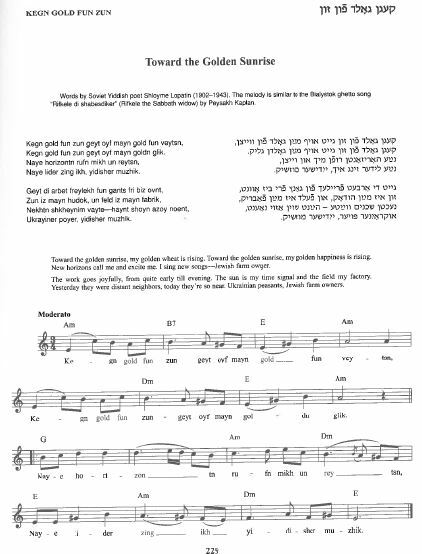 The words and music for the Soviet-Yiddish song Kegn gold fun zun have been published in Ruth Rubin’s Treasury of Jewish Folksong and Chana and Joseph Mlotek’s Songs of Generations (see below). The words were also included in Sam Liptzin’s collection Zingen mir (1974). 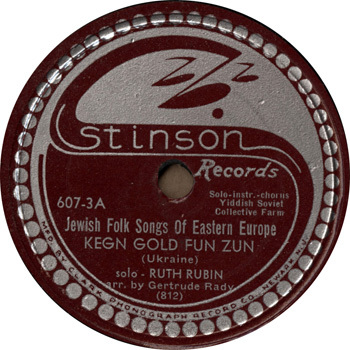 Apparently it was a well-known song in the 1930s- 1960s; however, the only recording of the song that we are aware of is on Ruth Rubin’s 1940s 78 rpm recording Ruth Rubin: Jewish and Palestinian Folksongs and among the field recordings in Ruth Rubin’s collection (tape 81) found in YIVO and other archives. The composer is unknown, but the text was written by the Soviet Yiddish poet Shloyme Lopatin (Lopate). According to Chaim Beider’s Leksikon fun yidishe shrayber in ratn-farband, (pp.194 – 195) Shloyme Lopatin was born in Belinkove, Ukraine in 1907. He settled in a Jewish colony in the Kherson area for several years and became a colonist. In 1929 he came to Odessa to further his studies. He published his first songs in 1928 in the Kharkov Yiddish journal Prolit, and among these first published writings was the poem Ikh, der yidisher muzhik (I, the Jewish Russian Peasant). Beider writes that this poem “immediately became so popular that people began to sing it as if it were a folksong, and it was then included as such in anthologies”. Lopatin died fighting on the Russian front in 1941. This week’s recording of folksinger Chaim Berman (d. 1973) was made by Rabbi Victor Reinstein in the 1970s. Berman’s words vary from the printed texts in the second verse, where he repeats the first two lines from the first verse. Singer George (Getsl) Ribak was born in Dvinsk, Latvia, and died in 1979 at age 93. He sang Yiddish songs in public at the local JCC. The recording was made in the 1960s by Ribak’s granddaughter Cheryl Cohen of Sarasota, Florida. It is one of several songs sung by her family that Cohen sent to Bob Freedman (of the University of Pennsylvania’s Robert and Molly Freedman Jewish Music Archive), and Bob sent it to me. I do not know this short drinking song, which Getsl Ribak sings with much gusto. According to Chana Mlotek, collector, YIVO archivist and author of Yiddish songbooks, the song originates from the early Yiddish stage, and she will write about this version in her next column in the Forverts newspaper. Ribak’s melody and rhyming schemes seem a little off. In parentheses I wrote what I believed to be the “correct” ending, grammatical form or dialect pronunciation. Clearly “glik” should rhyme with “kik”, not “kuk” for example. My grandfather George (Getsel) Ribak was born in Dvinsk, Latvia. He fled before being drafted in the Czar’s Army to Capetown, South Africa. He became a British citizen while working in the shoe making trade. He later fled to avoid the Boer War. He was in England, then in Canada, then finally to the United States. He lived with his wife Rose (Rochel Swirsky) in Chattanooga, TN, where he was in the meat market business. I think he also did house painting in Detroit. He and his wife finally settled in Bridgeport, Connecticut where he had a second hand clothing store. He would take the train into New York and make his purchases there, I believe. He and his wife raised 3 children, one of which was my mother. I remember spending weekends in their apartment, listening to WEVD, and seeing the Foverts newspaper. He loved to sing songs in Yiddish, Hebrew, and English with me for fun but he really enjoyed performing at the Jewish Community Center in Bridgeport for various events. He was not a professional singer but had a very strong and pleasant voice. He even performed at the Jewish Home for the Elderly in Fairfield, CT. while he was a resident there. He wanted everyone to be freylach! In dir, in dir, mayn gantser (gantse) glik. In you, in you, my whole fortune. Then I take a look at you. Tsu dir tsu dir, hob ikh lust. A riekh in dos (dem) gelt arayn. Ikh lakh mir oys fun der gantser velt. Nor tsulib dir du glezele vayn. The devil take the money! because of you my glass of wine.